Hey there, everyone! Tonight marks my favorite part of WPlus9 release week....the group post night! I love seeing all the projects together on Dawn's blog, and seeing how different we all create using the same stamps!! Tonight also means these new stamp sets are available to purchase, and I can't wait to see what YOU create with them once you receive them!! For tonight's card I wanted to use the other larger sentiment from "Love You More", as I haven't had a chance to use it yet. The sentiment has a special meaning to Dawn, which she wrote about on her blog this week. It is so nice that she shared that with us, and gave us a fabulous sentiment stamp for it! I did create my card for some challenges, and those will all be listed at the bottom. Here is what I created! Instructions: Make card from vintage cream cardstock, and brush distress ink along the edges. Cut heart dotted paper slightly smaller, and distress the edges. Wrap ribbon around the bottom, then adhere to the card front, rolling the upper right corner a bit. Sand the edges of a pink sticker, then adhere to the right side of the card. Cut a floral paper block and distress the edges. Wrap lace around the bottom, then adhere to the left side of the card, rolling the same corner. Diecut the label and distress ink the edges. Stamp the sentiment to it, and adhere. Add the flower to the lower left corner, and pull off the rhinestone accent. Tie a bow from matching ribbon, adhere to the middle of the flower, then add the rhinestone accent to the top of the bow. Add three pink jewels to the sticker to finish. Be sure to check out what Dawn and all the other design team members have created for the group post tonight. I know that it will be full of eye candy!! Such a gorgeous card yet again Lea! Sucy a beautiful card, I love the delicious colours and design, you really have do many scrumptious details. so so pretty...love what you have done with this new release...thanks for sharing.. This is so, so lovely, Lea! I am in complete agreement about the wonders of Group Release night - and how diversified we are as craters! This was SUCH a wonderful release - they always seem to get better, and that never ceases to amaze me! I'm adoring your card on EVERY level, but even more, since the composition is just a tad special to me - lol! OUTSTANDING work, this release, as always! Craft ON, sweet sista! xo! Lea, I love how you made the sentiment panel a soft, subtle color. Gorgeous card! thanks for playing along with us at Just Us Girls! This is gorgeous! I love the colors! So fresh and fun! And I love the sentiment, too! I've always loved that song! Thanks for playing with Just Us Girls! 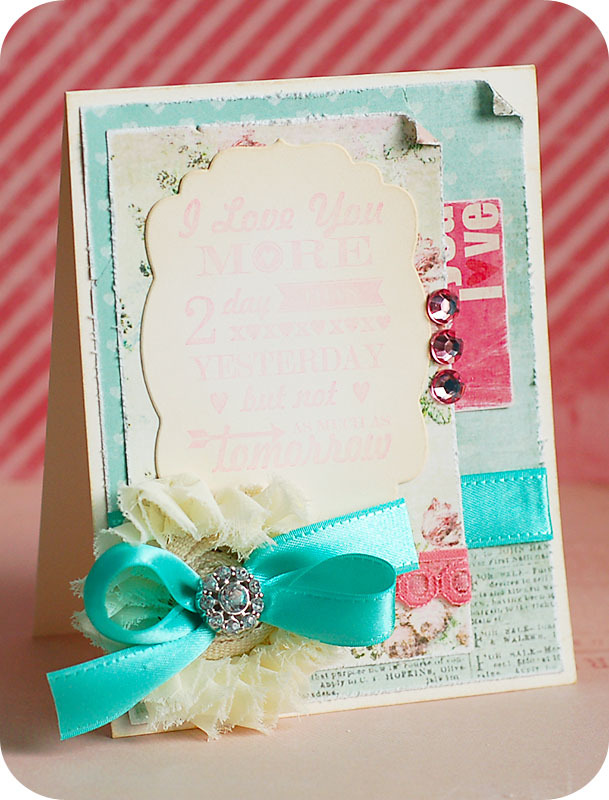 Wonderful colors on your pretty shabby chic card! Beautiful card Leah, so feminine and pretty. So soft and lovely, Lea! Thanks for playing along with CR84FN! So soft and elegant and absolutely gorgeous, girl! Way to rock this release! Just lovely - I like the subtle distressing and pretty chiffon flower, with the bright aqua ribbon. Thanks for playing along with CR84FN! Oh so striking and the color palette is so divine! Beautiful as always!!! !Thanks for playing along with wee Memories this week!!!! Lea, now I'm singing that sweet song :) What a GORGEOUS card! Love the sentiment and the beautiful flower! Thanks so much for playing along with CR84FN and Just Us Girls!